J. L. Austin was born on 26 March 1911. He was twenty-eight when the Second World War began, and served in the British Intelligence Corps. It has been said by G. Warnock that, “he more than anybody was responsible for the life-saving accuracy of the D-Day intelligence”. He was honoured for his intelligence work with an Order of the British Empire, the French Croix de Guerre, and the U.S. Officer of the Legion of Merit. Austin’s thought is that although someone who claims to know that there is a goldfinch should be able to say something about how they know, they needn’t be able to rule out every imaginable alternative. Let’s consider Austin’s thought more closely. I. You know that there’s a goldfinch. II. If you know that there’s a goldfinch, then you can show that there’s a goldfinch. III. You can’t show that what’s there isn’t stuffed. IV. If you know that what’s there isn’t stuffed, then you can show that what’s there isn’t stuffed. V. You don’t know that what’s there isn’t stuffed. 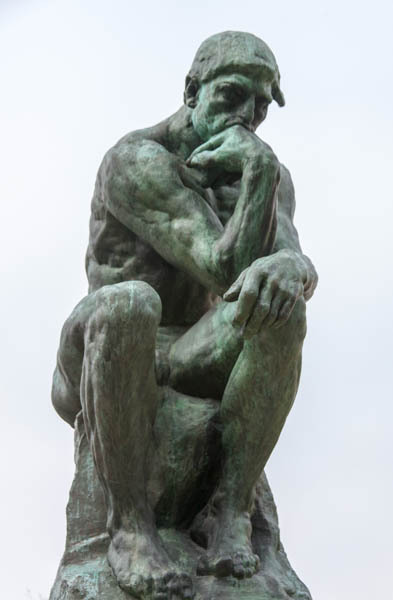 The Thinker by Auguste Rodin. Picture by Frank Kovalchek, CC BY 2.0 via Wikimedia Commons. VI. You know that if there’s a goldfinch, then what’s there isn’t stuffed. VII. If you know that there’s a goldfinch, and you know that if there’s a goldfinch, then what’s there isn’t stuffed, then you can competently deduce, and so come to know, that what’s there isn’t stuffed. VIII. You know that what’s there isn’t stuffed. But V contradicts VIII. At least one of the claims must be rejected. Austin isn’t explicit about which of these claims he rejects, and the question is contested. One suggestion is that Austin would reject VII: although deduction is often a way of extending knowledge, perhaps it isn’t in this case. An alternative is that Austin invites us to reconsider the general claim that if you know, you can show. I, VI, and VII indicate a way in which one can use knowledge that there’s a goldfinch in order to know that what’s there isn’t stuffed. Ostensibly, one might use such considerations in order to show that what’s there isn’t stuffed. But that suggests that Austin has something more specific in mind in denying that one can show that what’s there isn’t stuffed. Perhaps what he has in mind is that one can’t show that in a way that doesn’t beg the question, by presupposing that there is a goldfinch — something that, by nature, isn’t stuffed. Austin’s proposal would be that it isn’t invariably true that someone who knows that such-and-such can show that such-and-such in a way that doesn’t presuppose that such-and-such. Although it’s hard to be sure what precisely Austin took to be the consequences of his reflections for traditional philosophy, we can begin to see how there might be such consequences. Austin sought to bring very general philosophical claims into contact with the more secure array of data provided by our ordinary judgments about specific cases. His hope was that philosophers working together on the collection and analysis of such data might achieve the same sort of progress as his wartime intelligence operations. Featured Image credit: A European goldfinch sits on a fence in Sardinia, Italy. Francesco Canu, CC BY-SA 3.0 via Wikimedia Commons. Guy Longworth is Reader in Philosophy at Warwick University and Editor of the Proceedings of the Aristotelian Society. He is the author of the article "J. L. Austin" for Oxford Bibliographies in Philosophy.